Yesterday was Libby's last day of school until January, so we are in Christmas vacation mode at our house. She is determined to squeeze in a million activities while on break, and decorating sugar cookies was at the top of her list. I didn't include a recipe for icing. We just used MSPI-friendly store-bought icing, but there are several recipes on the internet available. Just use MSPI-friendly margarine and rice milk instead of butter and milk. There's also a glaze-like icing recipe included on the page where I found the original recipe for these cookies. Now these cookies won't win any awards for being the best tasting or best looking, but my kids had a fun, fun time decorating them and we will share this sweet memory long after the cookies disappear into our tummies. And that, my friends, is what matters! Merry Christmas! Cream together powdered sugar and margarine in a large mixing bowl. Mix in vanilla, almond extract and egg. In a separate bowl, whisk together remaining ingredients. Add the flour mixture slowly to the wet mixture and mix until properly combined. Cover and refrigerate four hours (or overnight) until dough is thoroughly chilled. Remove ¼ of the dough from the bowl and return the bowl to the refrigerator. Roll the dough you removed to ¼-inch thick and cut into shapes with cookie cutters. Place cookies on an ungreased cookie sheet. Once cookie sheet is filled, place it in the refrigerator. Continue to roll out and cut the remaining dough. Heat oven to 375 degrees. Grease a clean cookie sheet lightly or use a Silpat. 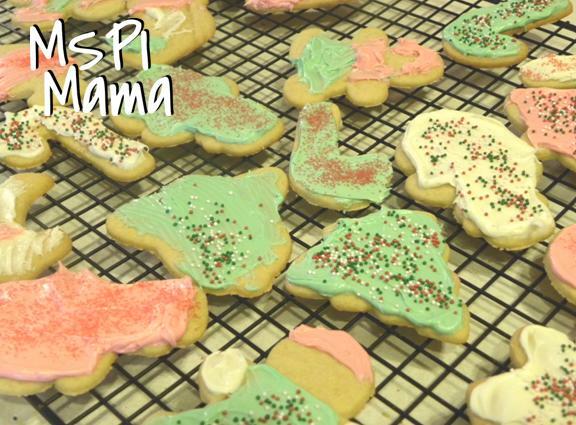 Arrange cookie cutouts that are in the refrigerator on the prepared cookie sheet. Bake 7-8 minutes or until edges are just barely golden. Remove from cookie sheet to cool while baking the remaining cookies. Tip: Can't use margarine because of the soy oil? Try substituting palm shortening for the margarine.